Significantly revised, the 2018 edition of NFPA 472 works to ensure responders can perform their expected tasks and handle haz-mat/WMD incidents safely and effectively. Adopted by the U.S. Department of Homeland Security, NFPA 472: Standard for Competence of Responders to Hazardous Materials/Weapons of Mass Destruction Incidents helps reduce accidents, injuries, illnesses, disabilities, and fatalities by ensuring that responders to haz-mat/WMD incidents are up to the task. 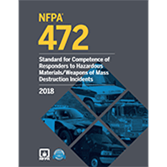 NFPA 472 identifies the minimum levels of competence required by responders to emergencies involving hazardous materials/weapons of mass destruction (WMD). It applies to awareness level personnel, operations level responders, hazardous materials technicians, incident commanders, hazardous materials officers, hazardous materials safety officers, and other specialist employees. Added chapters provide specialty or advanced specialty competencies for the technician level, including monitoring and detection, consequence analysis and planning, chemical risk assessment and analysis, product control, weapons of mass destruction, and decontamination. Revised chapters cover awareness and operations levels to correlate with the other documents. Two added operation level responder mission-specific competencies address diving in contaminated water environment and evidence collection. 3.4 Operations Level Responders Definitions. 4.2 Competencies — Analyzing the Incident. 4.4 Competencies — Implementing the Planned Response. 5.2 Competencies — Analyzing the Incident. 5.3 Competencies — Planning the Response. 5.4 Competencies — Implementing the Planned Response. 5.5 Competencies — Evaluating Progress. 6.2 Mission-Specific Competencies: Personal Protective Equipment (PPE). 6.3 Mission-Specific Competencies: Mass Decontamination. 6.4 Mission-Specific Competencies: Technical Decontamination. 6.5 Mission-Specific Competencies: Evidence Preservation and Sampling. 6.6 Mission-Specific Competencies: Product Control. 6.7 Mission-Specific Competencies: Detection, Monitoring, and Sampling. 6.8 Mission-Specific Competencies: Victim Rescue and Recovery. 6.9 Mission-Specific Competencies: Response to Illicit Laboratory Incidents. 6.10 Mission-Specific Competencies: Disablement/Disruption of Improvised Explosive Devices (IEDs), Improvised WMD Dispersal Devices, and Operations at Improvised Explosives Laboratories. 6.11 Diving in Contaminated Water Environments. 6.12 Mission-Specific Competencies — Evidence Collection. 7.2 Competencies — Analyzing the Incident. 7.3 Competencies — Planning the Response. 7.4 Competencies — Implementing the Planned Response. 7.5 Competencies — Evaluating Progress. 7.6 Competencies — Terminating the Incident. 8.2 Competencies — Analyzing the Incident. 8.3 Competencies — Planning the Response. 8.4 Competencies — Implementing the Planned Response. 8.5 Competencies — Evaluating Progress. 8.6 Competencies — Terminating the Incident. 10.2 Competencies — Analyzing the Incident. 10.3 Competencies — Planning the Response. 10.4 Competencies — Implementing the Planned Response. 10.5 Competencies — Evaluating Progress. 10.6 Competencies — Terminating the Incident. 11.2 Competencies — Analyzing the Incident. 11.3 Competencies — Planning the Response. 11.4 Competencies — Implementing the Planned Response. 11.5 Competencies — Evaluating Progress. 11.6 Competencies — Terminating the Incident. 12.2 Competencies — Analyzing the Incident. 12.3 Competencies — Planning the Response. 12.4 Competencies — Implementing the Planned Response. 13.2 Competencies — Analyzing the Incident. 13.3 Competencies — Planning the Response. 13.4 Competencies — Implementing the Planned Response. 14.2 Competencies — Analyzing the Incident. 14.3 Competencies — Planning the Response. 14.4 Competencies — Implementing the Planned Response. 15.2 Competencies — Analyzing the Incident. 15.3 Competencies — Planning the Response. 15.4 Competencies — Implementing the Planned Response. 16.2 Competencies — Analyzing the Incident. 16.3 Competencies — Planning the Response. 16.4 Competencies — Implementing the Planned Response. 17.2 Competencies — Analyzing the Incident. 17.3 Competencies — Planning the Response. 17.4 Competencies — Implementing the Planned Response. 18.2 Competencies — Analyzing the Incident. 18.3 Competencies — Planning the Response. 18.4 Competencies — Implementing the Planned Response. 19.3 Competencies — Planning the Response. 19.4 Competencies — Implementing the Planned Response. 20.2 Competencies — Analyzing the Incident. 20.4 Wide Area Monitoring and Sampling. 21.2 Competencies — Analyzing the Incident. 21.3 Competencies — Planning the Response. 23.2 Competencies — Analyzing the Incident. 23.3 Competencies — Planning the Response. 23.4 Competencies — Implementing the Planned Response. 24.2 Competencies — Analyzing the Incident. 24.3 Competencies — Planning the Response. 24.4 Competencies — Implementing the Planned Response. Update to the 2013 NFPA 472 to protect emergency personnel by making sure responders can perform their expected tasks and handle haz-mat/WMD incidents safely and effectively. Chapter 6 was expanded to include a new mission-specific competency for operations level responders who handle improvised WMD dispersal device disablement/disruption and operations at improvised explosive laboratories. Chapter 15 was expanded to include non-tank vessel information and is renamed Competencies for Hazardous Materials Technicians with a Marine Tank and Non-Tank Vessel Specialty. Interested in other editions of NFPA 472? Use the drop down menu above to select the edition year you need.